Molenbeek district, in the North-Western suburb of Brussels, Belgium’s Capital, has about 100,000 inhabitants and is known as a heavily immigrant borough with 22 mosques known to the local officials — more than four times the number of churches. A breeding ground for volunteers for jihadi groups in the Syrian civil war, breached out in 03/2011. It is almost certain that a terror cell of Molenbeek residents, was formed in Molenbeek neighborhood in 2012-14 by a local self-proclaimed Imam Khaled Zerkani . The Molenbeek cell included Abdelhamid Abaaoud, considered by the Belgian authorities as the ring leader, Marouane el-Bali, and the two Jihadists killed in the Verviers Raid, on 01/15/2015, Sofiane A., who has Belgian and Moroccan nationality and was born in 1988; and Belgian national Khalid B., born in 1991. .
No doubt that Molenbeek provided a sort of retreat and safe haven for Jihadists in Western Europe, especially Belgium and France. 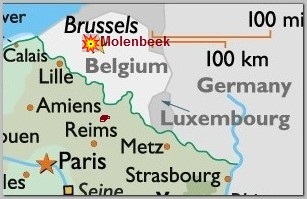 The presence of the Belgian police in Molenbeek is restricted and almost all police operations in Molenbeek ended not as expected because the anti-authorities attitude of the local inhabitants. The Paris Carnage fugitive, Salah Abdesalam, find refuge in Molenbeek for almost 4 months, before nabbed by police on Friday 03/18/2016. He was seen by local residents from time to time but still managed to evade the police. Yet another indication to the supportive atmosphere for outlow fugitives in Molenbeek.